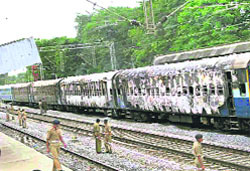 At least 32 passengers were charred to death and eight injured when the speeding Secunderabad-Kakinada Gouthami Express train caught fire in Warangal district of Andhra Pradesh in the small hours today. After being superseded for the post of CBI director, senior IPS officer M.L. Sharma, special director in the agency, has proceeded on indefinite leave. Sharma, a 1972 batch IPS officer from Rajasthan cadre, went on leave after it was conveyed to him last evening that the post was being given to Ashwani Kumar, DGP of Himachal Pradesh. The Editors Guild of India has expressed shock at the pressure tactics being adopted by the BJP against CNN IBN Television channel. BJP leader Venkaiah Naidu has declared that his party will boycott CNN IBN, if the channel does not immediately telecast the tapes of the sting operation carried out in concert with the BJP MPs in New Delhi on July 22 in connection with the vote of confidence in the Lok Sabha. The BJP leader has accused the channel of succumbing to government and corporate pressure. Defence minister A.K. Antony today made it clear that the armed forces should not be used on a regular basis for dealing with law and order problems. “We do not encourage it”, Antony said today. Gujarat’s turnaround at the 11th hour has once again dashed the hopes of Bhopal getting rid of the 390 metric tonnes of toxic chemical waste lying on the premises of the now defunct pesticide plant of the Union Carbide here for the past 24 years. In a letter to the Madhya Pradesh chief secretary, the Gujarat Pollution Control Board has made it clear that the “waste would not be allowed to cross the border of Gujarat”. One person was injured in a clash between Dera Sacha Saudha supporters and members of the Sikh community over morning prayers at Kaliya town in Rajasthan’s Sriganganagar district today, the police said. Singur witnessed fresh trouble today following an agitation by Mamata Banerjee supported Krishi Bachao Committee (KBC), which was obstructing Tata Motors engineers and workers from entering the factory in the last two days. The Army unearthed a fake currency racket thriving in south Assam area and arrested a deputy manger of the State Bank of India (SBI) and his accomplices. The accused were handed to the Silchar police in south Assam bordering Bangladesh. The issue of a compact disc having geographical and other information about the state, prepared by a private company owned by the brother of a senior bureaucrat close to Uttarakhand Chief Minister Maj. Gen. B.C. Khanduri (retd), has led to allegations and counter allegations between the opposition Congress and ruling Bharatiya Janata Party (BJP). With as many as 67 per cent of its residential buildings devoid of any seismic safety arrangements, Queen of hills Mussoorie in Uttarakhand could face a catastrophe if struck by an earthquake. The Amarnath Yatra Sangharsh Samiti, a conglomerate of 30 groups spearheading an agitation for the allocation of land to the Shri Amarnath Shrine Board, today said there would be no more talks with Jammu and Kashmir Governor N.N. Vohra. “Unless Vohra sends us any solid proposal on the land transfer issue, it is useless to continue the dialogue process with the Governor,” spokesperson for the samiti Tilak Raj Sharma said at a press conference here. The fire broke out in one of the sleeper coaches at 1.15 am near Kesamudram railway station, about 200 km from Hyderabad, and soon spread to four other coaches leading to heavy casualties, chief PRO of South Central Railways .P Krishnaiah told reporters. The tragedy struck when the passengers were fast asleep making it impossible for many of them to escape from the blaze. With the train moving at a speed of 100 km per hour, the fire, which broke out in S-9 coach, spread rapidly billowing out large plumes of smoke. Such was the impact of the raging fire that the bodies of some of the passengers were charred beyond recognition, making it difficult for the authorities to ascertain the exact number of casualties. Some passengers died due to suffocation. While railway officials were tight-lipped about the death toll, Warangal district Superintendent of Police V.C. Sajjanar said at least 20 passengers had perished in the fire. Chief Minister Y.S. Rajasekhara Reddy, who visited the accident site, put the death toll between 15-20. After being superseded for the post of CBI director, senior IPS officer M.L. Sharma, special director in the agency, has proceeded on indefinite leave. Sharma, a 1972 batch IPS officer from Rajasthan cadre, went on leave after it was conveyed to him last evening that the post was being given to Ashwani Kumar, DGP of Himachal Pradesh. Sources in the agency said Sharma had applied for leave late evening amid speculation that he may opt for premature retirement. It is believed that he was told he might be considered for some other post. The freedom of an editor to publish or telecast any news item cannot be subject to the approval or disapproval of a political party. In the instant case, the editor of CNN IBN has made it public that the investigation into the bribery case is incomplete and only if all the facts are authenticated, the channel will telecast the tapes. The Code of Practice of the Editors Guild of India also exhorts the editors to check and verify facts before publication or telecast. The channel had voluntarily submitted the tapes to the Speaker, Lok Sabha, who had set up a parliamentary committee to investigate the allegations of bribing of three BJP MPs. The Guild calls upon all editors to resist such pressure tactics from political parties and leaders which infringe the freedom of the Press. The armed forces should not be used as an extension of the police or the para-military forces to deal with law and order problems, Antony said. As a policy, the armed forces should be kept away from policing duties, said Antony, adding that states were best equipped to deal with ordinary law and order problems. And if they were not, they always had the option of calling in the para-military forces. The armed forces should be called in extraordinary situations, he said. This is the second time within a span of one month that Antony has cautioned against the use of the Army in tackling law and order problems. Earlier, he had opposed using the Army to tackle the growing Naxal problem in central India. The MP government has washed its hands off the entire issue saying that the MP High Court was seized of the matter and that it had been informed of Gujarat’s refusal via an affidavit submitted earlier this week. Gujarat’s has refused to dispose of the 350 tonnes of the waste by incineration at Ankleshwar in the state. The waste, lying on the plant premises since 1984, is a virtual store house of deadly chemicals. The detrimental effects of these chemicals on human body can cause cancer, damage liver, kidneys and lungs and many diseases. In the intervening years, the waste has seeped into the earth contaminating ground water in an area of over 10 sq km. The area is heavily populated and does not have piped water supply. Though the government agencies have sealed a dozen-odd hand pumps after a report by “NEERI”, Nagpur, saying that the water samples contained heavy metals and carcinogens, others continue to be used by the more than 25,000 people, who live in 14 colonies around the factory. In May 2004, the Supreme Court passed an order saying that the settlements around the Union Carbide factory should start getting clean drinking water before the onset of monsoons. But till date, only 30 per cent of work on the project has been completed. Legally and morally, the Union Carbide and after its take-over by “Dow Chemicals”- the latter- is responsible for safe disposal of the waste But beyond filing an application in the MP High Court asking the court to direct Dow Chemicals to pay Rs 100 crore as advance for the clean up, the government has done nothing to force the company to clean up the mess. The high court, which has been hearing a PIL on the matter since 2004, has also explored various possibilities. Initially, it asked the state government to contact the “Nuclear, Chemical and Biological warfare cell” in the Defence Ministry. The Defence ministry refused to take up the job and suggested that the “National Institute of Disaster Management” would be a more appropriate agency. Ultimately, after protracted arguments and after taking the consent of all concerned parties, the MP High Court in May this year, ordered that 40 MTs of the waste be transported to Pithampur in the Dhar district of MP to be consigned to landfills while the remaining 350 MTs be incinerated at Ankleshwar in Gujarat. The Gujarat government consented to the plan. But the plan faced its first hurdle in April when the company that had been given the contract for transporting the waste to Pithampur and Ankleshwar, backed out at the last moment. And now has come Gujarat’s refusal to play its role in the operation. The clash took place when one Gokul Chand, a dera devotee, organised “Nam-Charcha” at his residence, which was strongly opposed by his Sikh neighbours, SP, Sriganganagar, Alok Vashishta told PTI on telephone. Following heated argument over the issue, both sides indulged in stone pelting at each other in which one person was injured, he said, adding the victim was administered first-aid immediately. Two person of both sides, including Gokul Chand, were arrested, Vashishta said. Today, several engineers and workers left Singur apprehending attack. Already a section of workers had left jobs as they felt themselves unsafe at the Tata Motors plant. A large contingent of police deployed near the plant, however, did not take any action and remained a silent spectator. The CPM also did not oppose the agitation of the KBC. KBC leader Becharam Manna denied there was any intimidation or obstruction to workers. But a section of workers had left jobs voluntarily, as they wanted to extend support to the landless victims. Disgusted at the continuing agitation and obstruction at the Singur plant, Tata Motors managing director Ravi Kant threatened the state government on Wednesday after meeting Chief Minister Buddhadeb Bhattacharjee that they would stop their project at Singur if the “situation continued like this any further”. He said the people in the state now would have to decide if they wanted industries or not. Ravi Kant, however, assured the Chief Minister that they would be bringing out the Rs 1lakh Nano cars into the market during the festive months of September and October. These cars would not be produced at the Singur plant, but at the Pune plant. Worried about the uncertain future of the Singur plant, the CPM secretariat had already asked industries minister Nirupam Sen to personally negotiate with Mamata Banerjee and the Tata Motors management and resolve the present crisis. Sen today appealed to Mamata to come to the negotiating table and help the state administration solve the problems of the landless victims. He assured Mamata that they would agree to any proposals excepting their demand for returning 400 acres now part of the plant, which could not be separated from the project in any way. Mamata, however, had turned down Sen’s invitation. Acting on a tip off, personnel of the Army intelligence arrested Subarna Barman, the deputy manager of the SBI’s Haflong branch in North Cachar hill district of Assam and his accomplice Ritu Bora from Central Road in Silchar town along with fake currency notes worth Rs 1.55 lakh.aOn the basis of the information provided by the arrested duo, the Army arrested another person identified as P.Tamang from a hotel at Ganeshguri area in Guwahati and one Jamiruddin from Silchar. The police has registered a case. Congress legislators alleged that fear of exposure of alleged corrupt deeds of the state government and some of its top bureaucrats has led to the curtailment of the assembly session on July 30. A memorandum demanding resignation of the state government was submitted to the state Governor B.L. Joshi by the Congress legislators yesterday. Congress legislators had charged that a compact disc, prepared by a private company owned by the brother of the secretary to the Chief Minister Parbhat Kumar Sarangi, having detailed digitised information about Uttarakhand was sold for Rs 50,000 per CD to various departments of the state government. An amount of Rs 1.5 crore was made from them. “All this has been going on from the office of the Chief Minister, who himself launched the CD on July 26,” alleged Harak Singh Rawat, leader of the opposition in the state assembly. Rawat, along with party legislators, is determined to expose the corrupt practices of the BJP regime. “The fear of exposure has led to curtailment of the session. Otherwise why the state government that was bent upon passage of the controversial Universities Bill pack its bags within two hours of the start of the session,” he said. On the other hand, Parbhat Kumar Sarangi said not even a single CD was sold to Uttarakhand government during the Khanduri government. “A total of 120 CDs were sold during the previous Congress regime,” he said. He added that New Ink Publications (p) Ltd, a company owned by Parkash Sarangi, brother of Parbhat Kumar Sarangi, sold the 120 CDs to various departments along with Hiltron, a state government undertaking. However, Rawat said Parbhat Kumar influenced the decision to buy the CDs without calling any tender. “Even now he is promoting the sale of the CD,” he said. Meanwhile, Uttarakhand Chief Minister said he was prepared to order an inquiry if sufficient proof of any wrongdoing was provided to him. This was revealed by the Uttarakhand Disaster Mitigation and Management Centre’s (DMMC) survey held to asses the seismic vulnerability of Mussoorie residential buildings. Alarmingly, even the rest of 33 per cent of these buildings only have some sort of seismic arrangements, which in no way can be said to be full proof. The DMMC survey team that minutely studied the structural geology of as many as 3,350 residential Mussoorie buildings found most of them being constructed with unreinforced load bearing walls increasing their seismic vulnerability. The team came to a conclusion that 623 of these buildings would completely collapse in case a quake of intensity eight or more struck this tourist resort, while 587 of such buildings would be inflicted with very heavy damages. This could lead to the death of nearly 3,500 people as average occupancy of each residential building is estimated around five. Describing the survey as a precautionary exercise, Girish Chandra Joshi, a senior DMMC official, said the assessment was meant to ensure that we were not caught unawares in case a natural calamity like an earthquake struck this region that already falls in the high seismic zone. He, however, categorically denied that the survey was in any way aimed at creating a fear psychosis among the Mussoorie residents. The DMMC officials, who are now on way to submit their findings to the Mussoorie Dehradun Development Authority for remedial measures, have now taken up similar seismic vulnerability surveys in hill townships of Pauri, Srinagar, Tehri, Pithoragarh and Uttarakashi. One of Uttarakhand’s most popular hill resort Mussoorie attracts nearly 20 lakh tourists every year. It is also know for its educational institutions apart from the Lal Bahadur Shastri Academy of Administration that trains IAS probationers. Meanwhile, leaders of various political parties, minus the samiti and the BJP, today called upon the people of Jammu to maintain calm and help restore normalcy so as to ensure communal harmony in the larger national interest. In a unanimous appeal made after a marathon meeting of various political parties, convened by Vohra here this evening to take stock of the prevailing situation, the leaders urged the people of the state to maintain peace and calm in this difficult hour. “It is our collective responsibility to maintain peace and harmony across the region, the state and the country”, the appeal added. The appeal further said: “We believe that even the most contentious issues can be resolved through the democratic process, based on dialogue and reconciliation. The Governor had held discussions with the samiti yesterday and much wider consultations with prominent citizens earlier today, followed by his meeting with us, representing all political parties in the state. Earlier, addressing the meeting, the Governor said he was keen to resolve the issues relating to the samiti and the land through dialogue in such a way that helps in strengthening the infrastructure and upgrading amenities for Amarnath pilgrims on the entire route, both from Pahalgam and Baltal sides. Vohra apprised the political leaders of dialogue initiated by him with the samiti and said that it would be continued in a meaningful manner. Responding to suggestions about reducing the time frame of judicial probe into the alleged ‘disrespect’ to the mortal remain of Kuldeep Dogra at Bishnah, the Governor said that he would request Justice O.P. Sharma, the designated judge of the inquiry committee, to consider submission of his report within minimum possible time. Prominent among those present in the meeting were former Chief Minister and National Conference patron Farooq Abdullah, PDP president Mehbooba Mufti, Dharampal Sharma (Congress) and JKNPP president Bhim Singh. Solani river in spate: With incessant rains lashing the region over the past 36 hours, over 10 villages are under water from the overflowing seasonal Solani river here. At least two persons are feared drowned. Official sources said a few people were missing from Puana village. However, no loss of property had been reported. The gushing water in the untamed Solani, that caught locals unaware on Wednesday night, crippled life in over 10 villages in the region, the sources said.